ESPN’s 30 for 30 will meet HBO’s 24/7 when the sporting superstars team up on DAZN. Mexican superstar Canelo Alvarez faces Danny Jacobs in a middleweight unification clash on 4 May. ALL-TIME NBA great LeBron James and his athlete-empowerment brand, Uninterrupted, will produce a two-part series on Canelo Alvarez’s eagerly anticipated middleweight unification clash with Danny Jacobs at the T-Mobile Arena in Las Vegas next month. The series, which will air on the fight’s broadcaster, DAZN, as well as Univision, the NBC Sports Network and several regional outlets, will be a hybrid of ESPN’s 30 for 30 and HBO’s 24/7, per DAZN officials. Titled 40 Days, the Uninterrupted-produced show will provide a behind-the-scenes insight into both Canelo and Jacobs’ preparation for their 4 May showdown, the winner of which will be the consensus ruler at 160 pounds. It will air on DAZN on 23 and 30 April. James and his longtime business partner Maverick Carter will be executive producers on the two Canelo-Jacobs episodes. The series is tentatively slated to return for Anthony Joshua’s upcoming heavyweight world-title defence at Madison Square Garden on 1 June, the added complication of opponent Jarrell Miller’s failed drug test notwithstanding. “We’re partnering with DAZN to reach a whole new audience of global boxing fans that want to see another side to these athletes that has yet to be shown,” Uninterrupted CEO Carter said in a statement. “We’re thrilled to work with LeBron and Maverick on this partnership,” DAZN group executive chairman John Skipper added. They have a unique vantage point that allows them to understand both Canelo’s pursuit to be one of the greatest of all time and Jacobs’ dogged determination to reach the pinnacle of his sport. 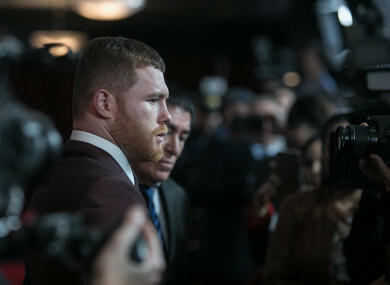 Canelo last year signed an 11-fight, $365m contract with sports streaming service DAZN — the biggest deal in the history of sport provided the Mexican indeed fights 11 times within the agreed five-year period. The 28-year-old is expected to meet fellow DAZN fighter Gennady Golovkin in a trilogy bout later this year if successful in his unification bout with Jacobs. On 4 May, however, IBF champion Jacobs will aim to derail those plans by adding Canelo’s WBA and WBC titles to his collection. Canelo-Jacobs will air on Sky Sports in Ireland and the UK. Email “LeBron to produce docu-series on Canelo's middleweight unification clash with Jacobs”. Feedback on “LeBron to produce docu-series on Canelo's middleweight unification clash with Jacobs”.